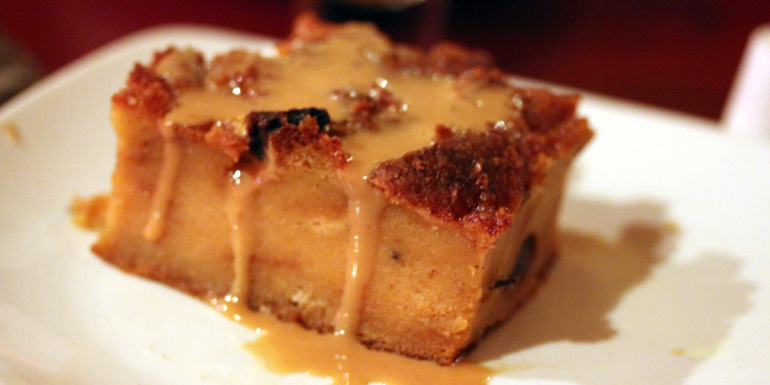 For the past five years, Norwegian Cruise Line has been dishing out its decadent bread pudding with sweet caramel sauce in the main dining room of all of its ships. We got our hands on the recipe, so you can satisfy the craving anytime. Sure, making it requires some baking skills, but the finished product is delectable hot out of the oven. And though we know the recipe doesn’t call for it, we suggest serving this dessert with a scoop of vanilla ice cream or a swirl of fresh whipped cream. On a sheet pan, spread the bread cubes and brush with melted butter. Sprinkle ¼ cup sugar over the top and bake to a golden brown, approximately 5-8 minutes.. In a mixing bowl, combine the eggs, ¾ cup sugar, vanilla, and milk until completely blended. Strain through a sieve. Place the toasted bread cubes in a standard cylinder mold pan or muffin pan that’s been coated with nonstick cooking spray. Pour the liquid mixture over the bread and press the bread down to allow it to soak. Let it sit for a half hour. Bake in a water bath at 350 F for about 30-35 minutes, or until set. Combine the sugar with the glucose or corn syrup in a saucepan and cook over medium heat, stirring constantly until all of the sugar has dissolved. Stop stirring and continue to cook until the mixture is a golden brown. Remove from heat and shock the saucepan in an ice bath to stop the sauce from cooking. Remove the pan from the ice bath and stir in the butter. Carefully stir in the hot heavy cream, mixing until fully blended. Cool before serving on top of the bread pudding. What’s your favorite sweet treat to splurge on at sea?